West Raynham is the largest village on the Raynham estate, the handsome estate village right at its heart. Unlike the other villages on the estate, however, it no longer has its own parish church. 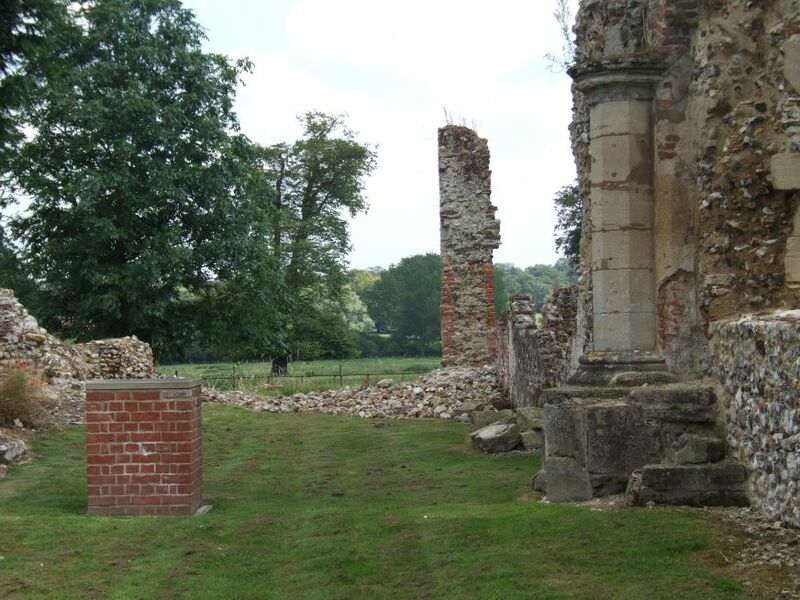 St Margaret was abandoned in the 18th century, and the living consolidated with that of West Raynham, where the church sits beside Raynham Hall. St Margaret must have been a fairly typical church for this part of Norfolk, a small north aisled church of the 14th and 15th centuries. There seems to have been a processional way beneath the tower. It is a mark of how our attitudes to ruined churches have changed over the last couple of decades that Pevsner's revising editor, Bill WIlson, came here in the 1990s to find it thickly clothed with ivy and elder. He would be surprised to see that this has now all been removed. 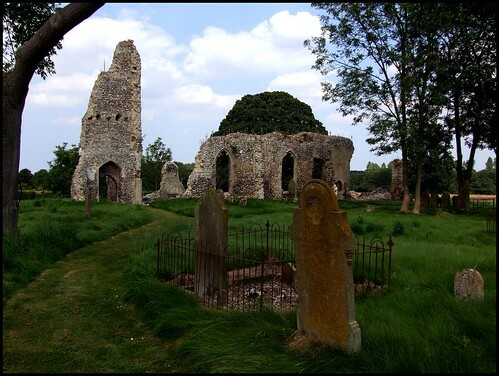 As at several other ruins in the Fakenham area, the walls have been topped off to prevent further erosion, the grass is cut, and the gravestones are all accessible. 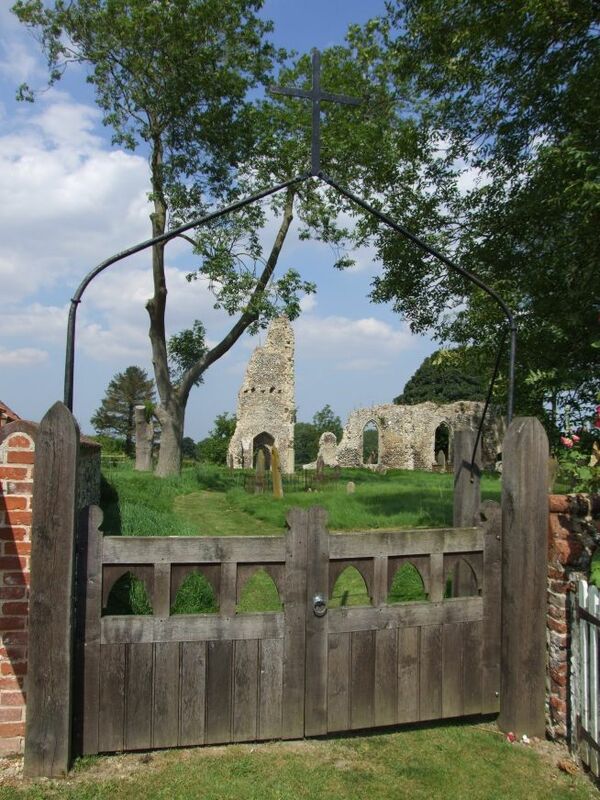 Apart from some wild flowers growing incongruously at the top of the tower, the site has been tamed, and does not seem at all out of place on the main village street; most wilder ruins, after all, are in the back of beyond, but there are plenty of houses around the churchyard here. As I say, there are plenty of tamed ruins nearby - Appleton and Oxwick spring to mind - but the restorers of West Raynham have gone one better. 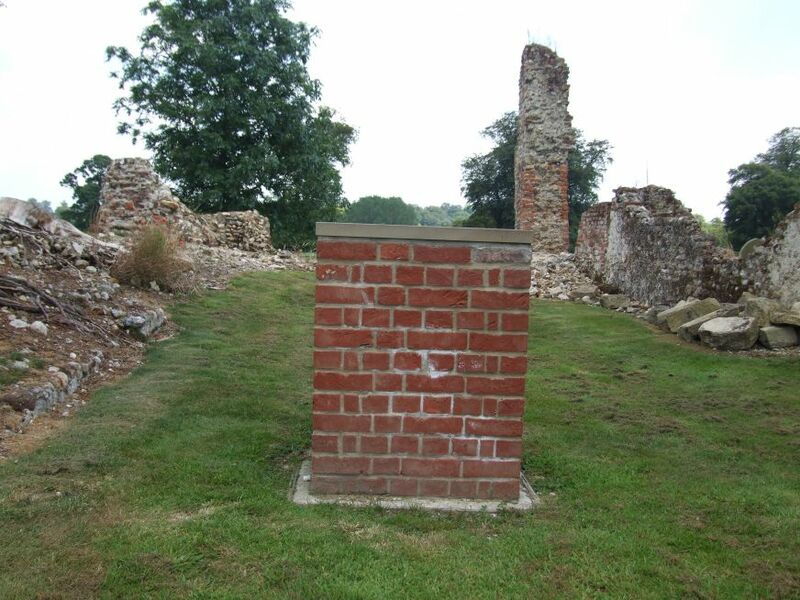 Or two, perhaps, because within the body of the ruin there are now what looks like an 18th century font, and a modern brick built altar. And so, for the first time in coming on for 300 years, St Margaret can be used again, at least when the weather is nice. It must be a very atmospheric experience, and moving for people who remember it as Bill Wilson saw it. Also moving are the gravestones, rescued along with the church. My favourite is near the gates. The inscription tells us that this stone is Erected by Friends and Pupils as a Mark of Respect and Esteem in fond Remembrance of Horace Beck Scott, who for 5 years Faithfully Discharged the Duties of Pupil teacher in the Helhoughton School and was Called to his Rest April 13th 1882 Aged 21 years.